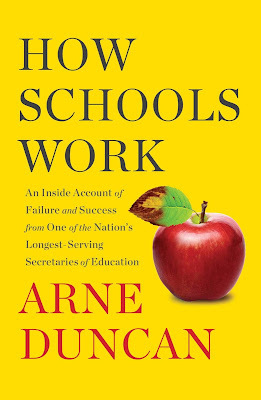 Brooklyn Digest: Books: Arne Duncan On "How Schools Work"
Arne Duncan was Secretary of Education under President Barack Obama, and was one of the longest-serving members of the cabinet. 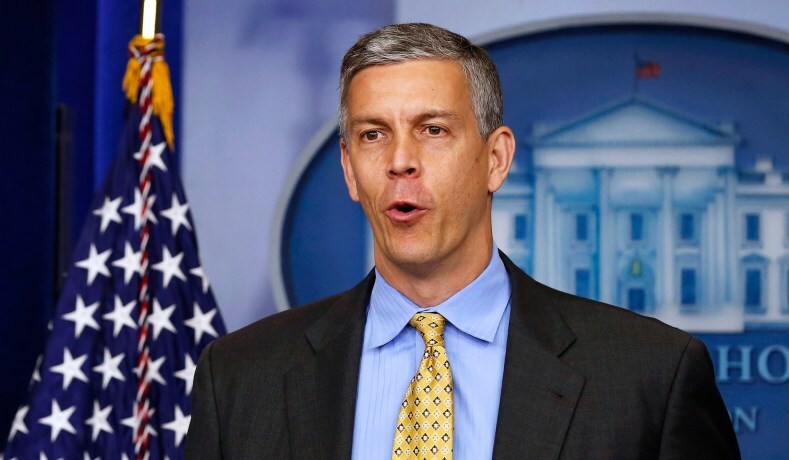 Duncan was one of the most influential secretaries of education in history, and he has spent nearly three decades working across all levels of education, from his mother's after-school program on Chicago's South Side to CEO of the Chicago Public Schools. Now a managing partner of Emerson Collective, Duncan is out with a new book, How Schools Work, on how education in America works, and what drives it. "Education runs on lies," writes Duncan. "That's probably not what you'd expect from a former secretary of education, but it's the truth. How schools work best is often by confronting and fighting these lies, but this is exhausting and sometimes perilous work usually undertaken by an isolated teacher or principal. So, the lies persist. They are as emblematic of our system as an apple left on the corner of a favorite teacher's desk. But, unlike the apple, the lies aren't sweet. They are overripe and rotten...Nearly all of the lies had to do with money and where power is concentrated, not with education." Duncan feels that we lie when we say that teachers can't be held accountable for how much their students learn. We lie when we maintain that around $650 billion per year nationwide is enough for education. We lie when we tell some high school students that they are ready for college. 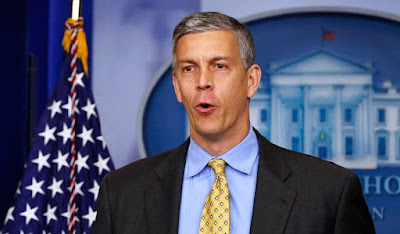 Duncan, one of the most influential education secretaries in history, identifies what helps kids succeed, including universal pre-k, after school programs, serious training for teachers, paying principals and teachers more, being able to earn college credit in high school, real accountability, and making community college free. He argues that the United States is capable of improving things because it already has. While the U.S. has fallen in global education rankings, high school graduation rates are up. The public school system has become more diverse and poorer since the 1970s, but students are performing 2.5 grades higher than their peers from 50 years ago. Duncan writes in a blunt, straightforward style, with some fiery language thrown in, as he shines a spotlight on teachers, principals, reformers, staffers, businesspeople mayors and presidents that have helped and hindered the education of America's children. The time is now to continue reforms rather than sabotage the public education system in favor of one that is purely a private enterprise. There is one factor Duncan brings up that is not obvious to how serious this is to the future of the country. "We cannot rest on our laurels and idly watch as other countries continue to eat our school lunch, writes Duncan. "Nothing short of our national security and economic future is at risk. "I mention national security for a reason. I often say that a strong military is our best defense, but that our educational system is our best offense. Our citizens and our leaders would never allow the United States not to have the world's best military, so why, then, do we allow ourselves to have a subpar educational system? Including higher education and across all levels of government, we spend a total of roughly $1 trillion a year on education, but this isn't enough. Our national security is measured not merely by tanks, aircraft carriers, and troops but also by our ability to generate and retain the world's most educated, most innovative, and most entrepreneurial citizenry. As impossible as it may sound, I'd like for us to spend twice as much on education - so long as we as educators are willing to hold ourselves accountable for better outcomes. I believe this investment would give untold returns, and that education is our best guarantor for American greatness over the long term. A smart and educated citizenry is the root strength of a democracy. It is also the source of all of our soft power, which has done as much or more to further the American ideal and creed than any of the wars we've waged. Furthermore, it's the source of our individual freedom. I mean that literally. Ask yourself who has more freedom, who has more options in his or her life: the person who dropped out of high school or the person who graduated from college? We debate endlessly the merits of spending a few thousand dollars to send one more child to pre-K, but think nothing of locking up one more adult at the cost of $75,000 per year. Why is that? "I believe that how schools do not work is the converse of the above: no support for pre-K or early education programs; no access to after-school programs or enrichment; a failure to meet the social and emotional needs of children; closing and locking a school's doors after the bell rings at three o'clock; pretending that teacher quality doesn't matter and that school leadership is unimportant; not giving high school students the ability to gain real skills in high school; and not bothering to place graduating high school seniors in postsecondary programs that meet their needs, abilities, and desires. "Ultimately, schools won't work if we refuse to believe in them or in their power to change lives. We must believe in free, high-quality public education. There is no substitute for it. And, while we have so much work to do to catch up with our international peers, we also have plenty of reasons to believe. Some would say otherwise, especially some in the current administration, but don't believe them. Education reform is working. There is never an end here, it's always a journey. There is always room for improvement, yet we have improved." How Schools Work also is a memoir of Duncan's rise from a basketball-crazy kid in Chicago making his way through the education system, to his stint as Secretary of Education, and beyond. He shares his successes and missteps as he takes on challenges at every turn: gangbangers in Chicago housing projects, parents who call him a racist, teachers who insist they can't help poor kids, unions that refuse to modernize, Tea Partiers who call him an autocrat, affluent white progressive moms who hate yearly tests, and even the NRA, who labeled Duncan the "most extreme anti-gun member of President Obama's cabinet." Duncan also talks about how his mother taught him that children must be clothed, fed, and listened to before they could be taught; the shock of discovering a classroom of Chicago sixth graders who were given no work assignments but coloring pages, construction paper, safety scissors and tape; and the heartbreak of realizing a friend with a promising athletic career wouldn't get into a Division I school, despite being on his high school's B honor roll. The main goal for Duncan is to have people change their thinking on schools, as he writes, "Think of your local public school as your personal property, because they are. no other public investment is more closely tied to the American Dream than the quality of education in your community. Act like it."